Summer is the perfect time to plan outdoor family fun. 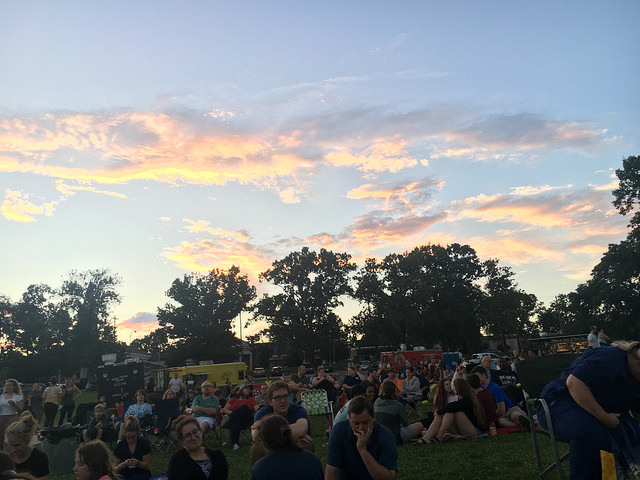 There are several outdoor movie nights in the Middle Tennessee area and it’s a great way to trade Netflix on the sofa for a movie under the stars. Pack a comfy blanket or three and cash for concessions and food truck fare and settle in for a movie experience your family won’t forget. We finally made it to our first ever Movies at the Park at Elmington Park last week for Secret Life of Pets. I wanted to take my younger daughter and a friend last summer but the event was cancelled due to thunderstorms. The crowd settles in for the movie at Elmington Park as part of the Nashville Scene’s Movies at the Park series. Outdoor summer movie outings are perfect for kids of all ages. We saw young families with babies in strollers, toddlers in tow, teens milling about and lots of fur babies as well. Both my tween and teen daughter and their friends had a blast. We also enjoyed all the food truck offerings! 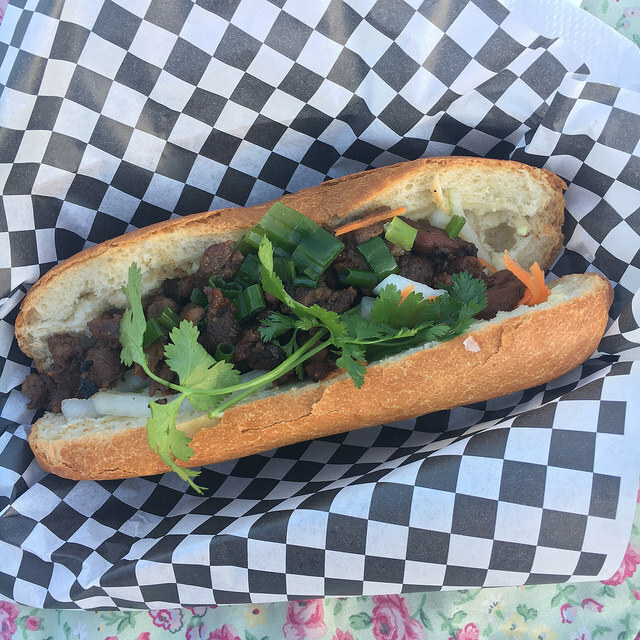 Hubby and I split this amazingly fresh and yummy sandwich from Banh Mi & Roll Factory. This Nashville Scene sponsored series takes place on the expansive lawn at Elmington Park located at 3531 West End Avenue adjacent to West End Middle School. The Movies at the Park series is now over for the summer so be sure to mark your calendars for next year. Food trucks, and furry critters, abound. If you haven’t been to Leiper’s Fork in rural Williamson County, you are missing out! We love to drive there in the fall for a country breakfast, but summertime is a great time to pack up the family and head to the Lawnchair Theatre, now in its 14th year. Located in the back yard of The Leiper Creek Art Gallery at 4144 Old Hillsboro Rd., the theatre features free family oriented movies in a beautiful and rustic outdoor venue every Friday night at 8. Concessions include freshly grilled burgers and hotdogs, nachos, assorted sodas and, of course, fresh and hot popcorn. Fresh veggies for the burgers are grown and sold locally at the farmers stand located by the Harpeth River in Franklin, Tennessee. $6 per person if entering the zoo after 6 p.m.
Did you know that the Nashville Zoo offers three summer family movie nights starting in May? Zoovie Nights include games, inflatables, music, crafts and after-hour access to the carousel and zipline (additional fees apply). When the sun goes down the evening’s feature film will play on a large inflatable screen, so pack a blanket and head to the zoo! Click here for the schedule. Headed to the lake this summer? Enjoy a day at Nashville Shores water park and stay after dark on select Fridays for a family friendly movie night. Dive-In movies are included with a Nashville Shores season pass or paid waterpark admission on that day (tip: all admission fees are reduced to $19.99 for entrance after 4 p.m.) The movie will begin at dusk, approximately 8:30 PM. Dates and times are subject to change without notice. This West Nashville microbrewery hosts a family friendly movie night on Fridays all summer long. From Wayne’s World to the Lion King, they feature a wide variety of movies as well as what I can tell is probably the longest series in the Nashville area, with movies scheduled into September. No outside food or drink allowed. TailGate has a full menu, from pizza and sandwiches to a Nashville inspired Goo Goo Cluster dessert pie. Dogs are allowed on leashes. Live on the South side of Davidson County in neighboring Williamson County? The City of Franklin hosts a free series of free family movie nights at Pinkerton Park (405 Murfreesboro Rd.) for an evening movie! Movies begin at sunset and concessions are available for purchase. The city has added a new event for ages 21 and up this summer. This addition to the summer movie in the park series will be held at the Eastern Flank Event Facility (1368 Eastern Flank Circle). This entry was posted in Nashville and tagged family fun, family movie nights, Nashvile, summer Nashville fun.